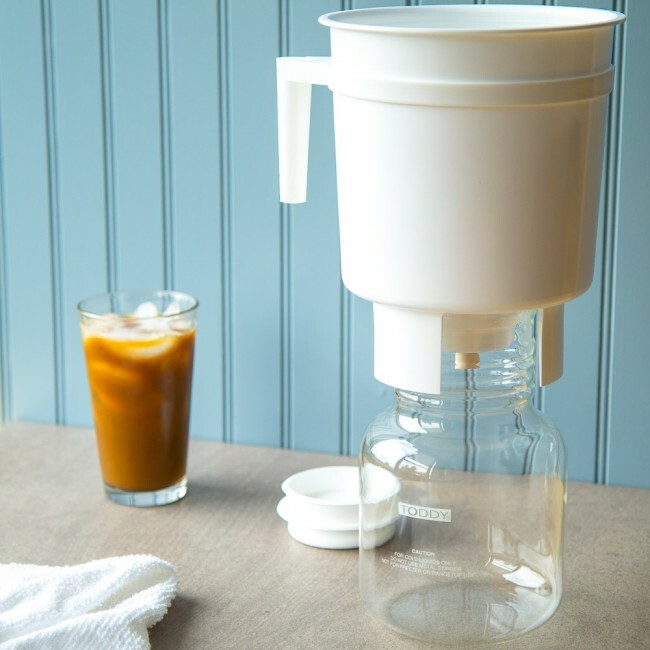 Prep for the heat once a week with the Toddy Cold Brew System. 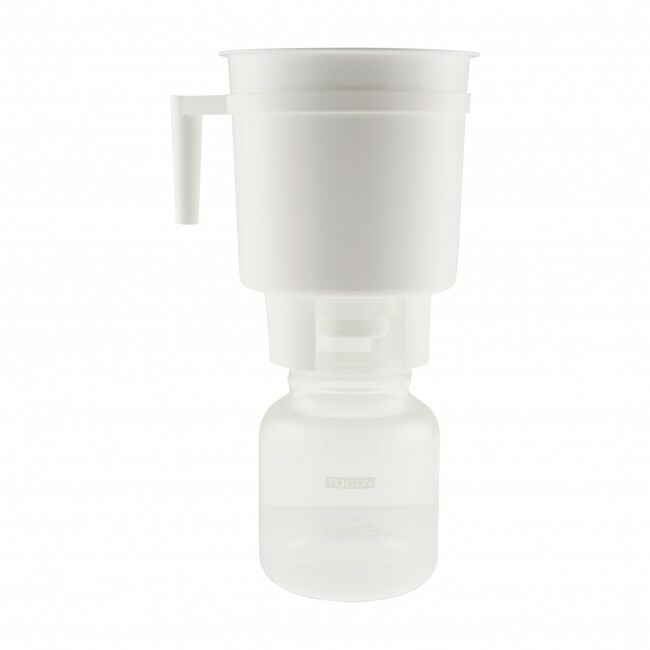 The large carafe size lets you brew up to two weeks worth of cold brew concentrate. Simply add water or milk, ice and go! Each filter can be reused up to 10 times, that's almost a year's worth of coffee! Insert Stopper - Insert stopper from the outside of the brewing container. Adding the stopper from the outside of the container will allow you to remove and release concentrate when the container is full of coffee grounds. 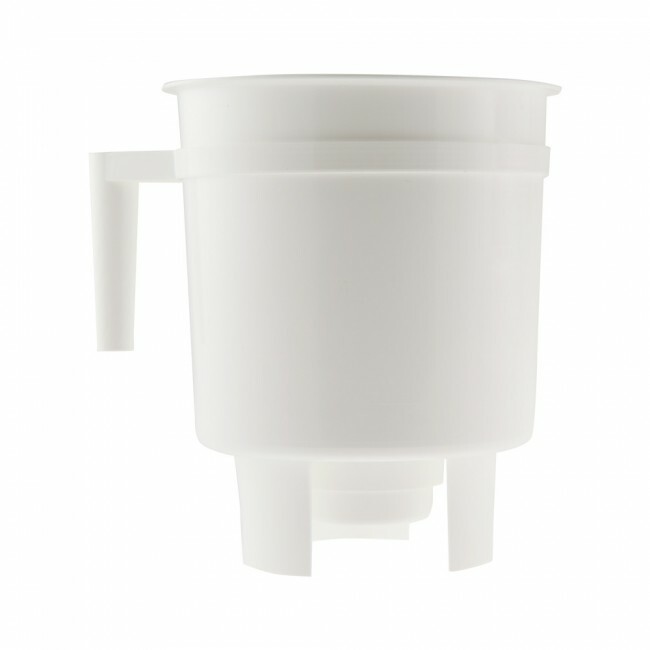 Insert Reusable Filter - Dampen the reusable filter and insert it into the inside bottom of the brewing container. Add Water and Coffee - Add approximately 1 cup of water into the bottom of the brewing container. Next, add approximately 6 ounces of coarsely ground coffee. Then, in a circular motion slowly pour 3 more cups of water over the coffee grounds. Once complete, add 6 more ounces of coarsely ground coffee. Lastly, wait 5 minutes and then slowly add the last 3 cups of water. Do Not Stir - Toddy recommends not stirring the grounds, as this may clog the filter. Lightly Press - Since you are not able to stir, Toddy recommends lightly pressing on the topmost grounds with the back of a spoon to help completely saturate the coffee grounds. Brew and Wait - Allow the coffee grounds to steep for 12 - 24 hours. Drain - Once steeping is complete, place the container on top of the open glass decanter and remove the stopper from the bottom of the brewing container. Allow the coffee concentrate to fully drain into the glass container. The coffee concentrate will stay fresh for up to two weeks in your refrigerator. Enjoy! - Because the Toddy brews a concentrate, you will want to add either cold or hot water or milk to make a deliciously smooth drink. Sit back and enjoy the fruits of your labor! Coffee Drinks Aplenty! - With the end result being a concentrate, you can create several delectable drinks with only adding hot or cold milk or water. Toddy takes it one step further by providing a few recipes with the instruction booklet. Create a Toddy Iced Mocha, latte or frappe using the concentrate you just created. Accessories - Along with the handy brewing container, this cold brew system also includes a glass decanter with lid for easy storage in your fridge. 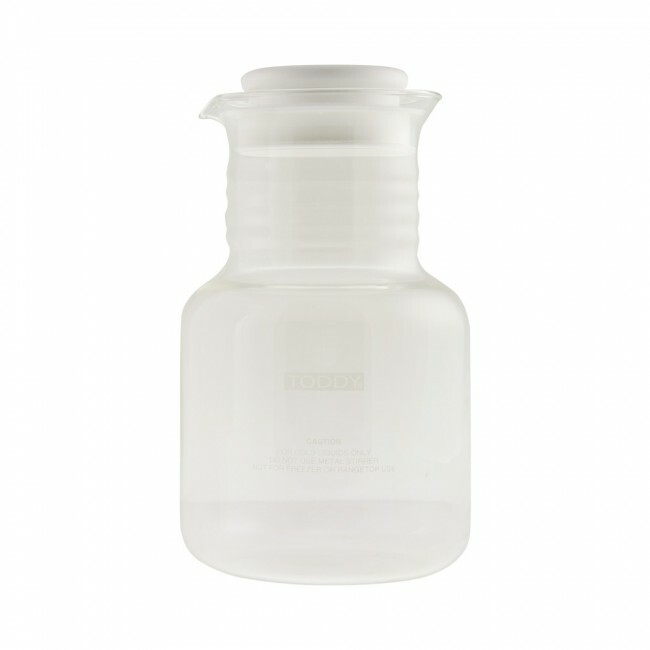 In addition to the decanter, you also get two reusable filters and one natural rubber stopper. Each reusable filter can be used up to 10 separate times or after 3 months from the initial use (whichever comes first). Cold Brew Tea - It may sound crazy, but sometimes you just need a break from the normal coffee routine. While we weren't able to try our hand at Toddy tea making, Toddy's instructions indicate you are able to brew a cold tea concentrate using this system. The ratio is different than when making cold brew coffee, but we think it could work! Mildly Messy - The used grounds from a normal drip coffee brewer are easy to clean-up, because you simply throw out the paper filter with the grounds in it. With the Toddy you don't have the luxury of brewing through a disposable paper filter. This makes the cleaning process a little more manual, but nothing a good old fashion scrubbing can't handle! Flimsy Handle - With 12 ounces of coffee grounds and 7 cups of water, the brewing container can get a little heavy. All of that weight made the handle feel a little unstable. If you feel a little insecure about the handle, we recommend holding onto the brewing container when transporting the Toddy. Better safe than sorry! Sans Lid - After experimenting with both the home and commercial Toddy, we thought it would be nice to have a lid for the home brewing container, much like the commercial version. The brewing container and decanter are dishwasher safe, but the reusable filters must be rinsed after each use with filtered water and no soap. Once rinsed, Toddy recommends placing the damp filter in a zip bag and then placing the bag in the refrigerator or freezer for maximum freshness.